An increase of 0.25% in the overnight policy rate (OPR) will not have a significant impact on borrowers for low-cost and affordable housing priced between RM45,000 and RM450,000, according to a senior executive of a real estate agency. 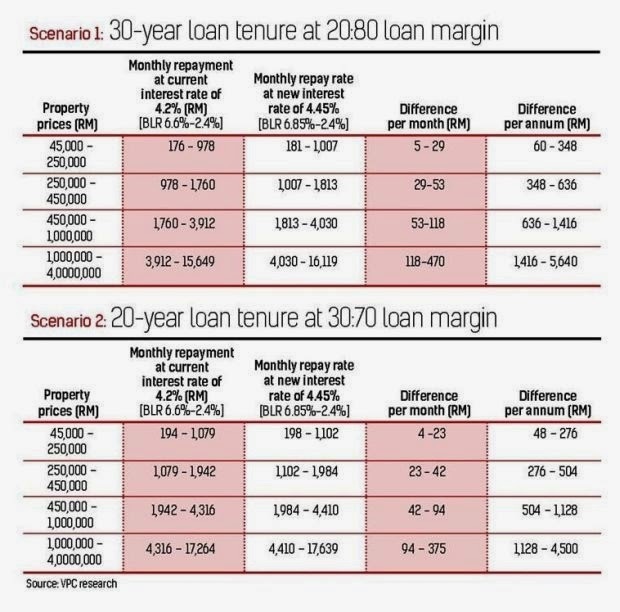 VPC Realtors (KL) Sdn Bhd director James Wong said there would only be an estimated marginal increase of RM5 to RM53 per month in loan repayment compared to the previous interest rate for a 30-year tenure with a 20:80 margin (see chart). “As for high-end residential properties, most buyers are either cash buyers or they buy with a minimum loan margin. Hence, an increase of 0.25% per annum will be insignificant,” he added. Bank Negara has raised the benchmark overnight policy rate by 0.25% to 3.25%, the first rate hike since June 2011. Mortgage rates are based on the base lending rate (BLR) which in turn is correlated to the central bank’s OPR. Wong felt that speculators would be hit the most. “If they are unable to service the loan, they will be forced to sell. But it will not be as easy as before due to the real property gains tax,” he said. Wong did not expect rental rates to be impacted by the increase in interest rate as the rental market was primarily determined by demand and supply. Property consultants expect fewer transactions as mortgage rates will rise in tandem with the interest rate.